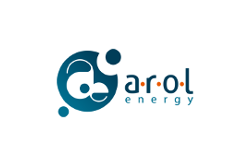 Arol Energy proposes an innovative business model based on turnkey solutions, addressing both the economical and technical issues of each customer. Arol Energy has the ability to address the three conversion segments: electricity into biomethane for gas injection and then biomethane for biofuel. Current biogas producers experience uncertainty in their expected return when investing in technical solutions aimed at transforming biomass into an energy resource. Arol Energy’s Amine product is a purification unit which transforms raw biogas into biomethane based on highly efficient removal of CO2 by heat-driven amine. The biomethane is then available for injection into the natural gas grid or use as vehicle fuel. Amine uses standardised modules which produce high purity biomethane (> 98% CH4) causing limited methane losses of no more than 0.1% making off-gas treatment unnecessary. The product also recovers latent heat reducing energy costs thus improving the overall financial return and saving energy. Gas processing and renewable energy production. Turnkey engineering design (standardised design or design adapted to the customer’s needs). BIOVALIS, local municipality as final customer. Industrial pilot at scale 1/5 in the testing stage on a landfill in France operated by ENGIE group.